I suspect many teachers feel like I do. We go to our classrooms and perform our jobs, and we are very good at what we do. However, it isn’t in our nature to think we are the experts and should be telling others how to do their job. Somehow, sharing our thoughts and ideas through social media including Twitter may feel more like “tooting our horns” than taking part in a professional conversation. It is time to move on from that type of thinking and recognize that each of us has something to contribute to educational conversations, and Twitter is the perfect vehicle for sharing and learning from other educators around the world. As you prepare for the upcoming school year, consider how to use Twitter as a way to become an active participant in educational conversations by sharing your ideas, questions, successes, and failures. TeachersFirst Twitter for Teachers Resources provides an excellent overview of getting started on Twitter. In addition to an overview of using Twitter in the classroom, this section of our site includes a list of tools and add-ons for improving and organizing your Twitter experience. 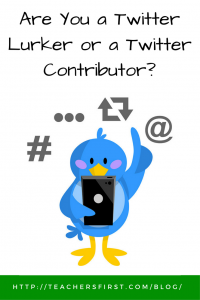 Resources include ideas for scheduling tweets to send, creating a newspaper from your Twitter account automatically, and suggestions for whom to follow on Twitter. One of the best ways to gain confidence in becoming part of a Twitter conversation is through the development of an online Professional Learning Network (PLN). Begin by following other educators on Twitter; many lists offer suggestions to get you started; I like this one at twitter4teachers. It provides links to Twitter users sorted by content area. Continue to develop your PLN by participating in Twitter chats. Twitter chats offer excellent opportunities to focus conversations on specific topics as you learn and share ideas and resources. This education chat calendar lists upcoming Twitter chats. TeachersFirst also facilitates Twitter chats throughout the year; look for dates and times on our website calendar. PLN’s offer the best of all professional development because YOU choose what you want to learn about, and how you want to learn. Grow your PLN by following people and hashtags as you find new voices during Twitter chats or through references in tweets of educators you already follow. Once you have a steady stream of information coming into your Twitter feed, it helps you understand the diversity of ideas and resources available that may be new to you. Start asking questions or responding to tweets. If someone shares information about a teaching strategy, don’t be afraid to ask for additional information. 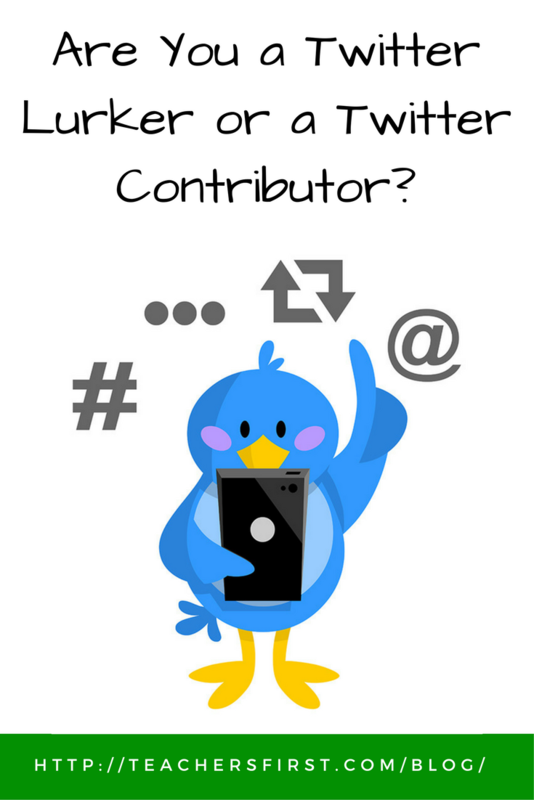 Most educators on Twitter are there because they want to interact and share with others. Another way to find new people to follow is by looking at those you already follow. Click on the profile of anyone on Twitter to see whom they follow. Profiles provide a whole new list of follow-worthy suggestions to add to your Twitter feed. Sharing ideas and information with others is vital for developing our classroom skills and expertise. It only makes sense that expanding our sources of information will make us better-informed educators. Sharing experiences and asking questions encourages conversation and discussion of any topic. Just think…you have a whole world out there to assist you with any questions you might have! Recent discussions on Twitter that are keeping me up to date with what teachers are sharing include conversations about the book Teach Like a Pirate (#tlap), information on how to include BookSnaps in the classroom (#booksnaps), and allowed me the opportunity to learn from the latest presentations at the International Society for Technology in Education conference (ISTE) (#NotAtISTE17). All of this is because of the many educators willing to share their ideas and thoughts online with others. When preparing for a new school year, it is important to reflect upon past experiences and set goals for the upcoming year. My goal is to become more of a participant within my Twitter community instead of just lurking. What is your goal? Interested? If so, start by following me at @shall85917 as I work toward becoming a more involved Twitter contributor.